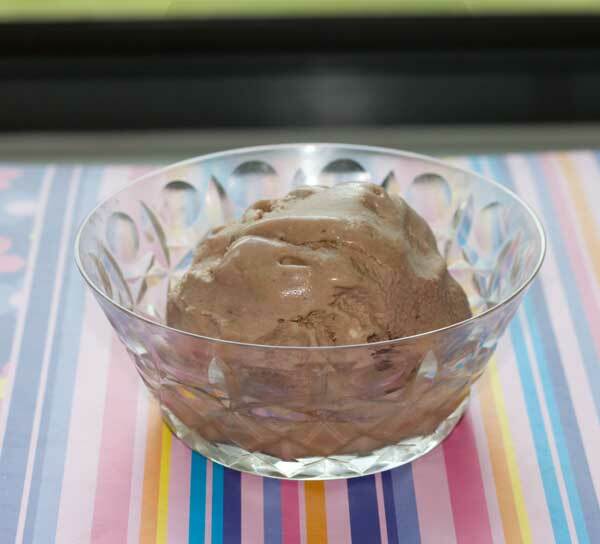 Would you believe this rich, creamy, chocolate ice cream is made with only three ingredients? Okay, four if you count the fact I made one tiny addition. But “Hazelnut Joy Ice Cream” is comprised of JIF Chocolate Hazelnut Mocha Spread, Cream of Coconut, and half-and-half. I found the recipe on JIF’s website (while looking for new ways to make Monster cookies, btw! ), and had to see if mixing three simple ingredients would result in decent ice cream. The verdict, after combining the ingredients and throwing them in my much-loved yet falling apart ice cream maker, was that the ice cream was a little bit too sweet. As a remedy to that, I whipped 6 ounces of plain whipped cream, folded it into the ice cream maker, and let it churn for a few more minutes just to mix. The ice cream looked a lot like the soft serve photo in JIF’s picture, but possibly a little softer. After the recommended 4 hours in the freezer, it was perfect. Another positive thing about this recipe was that after 24 hours in the freezer, the ice cream did not develop any graininess. It did get hard and it did need to sit for a few minutes before being scooped, but it still retained a creamy, smooth texture when softened. Here’s a link to the Hazelnut Joy Ice Cream recipe. My tip is to measure out about 5 or 6 ounces of cream, whip it, then add it to the mixture. If you don’t want to buy half & half and whipping cream, use 1 cup whole milk and 1 cup of heavy cream as a substitute for the 2 cups half & half, then measure and whip the additional 5 or 6 ounces of heavy cream. Or just ignore all my tips and try the JIF recipe. Whoever came up with the idea to combine hazelnut spread, cream of coconut and half & half is a genius! Rich and creamy ice cream that combines chocolate hazelnut and coconut flavors. Beat 3/4 cup of heavy cream until stiff peaks just start to form. Set aside. Scrape into ice cream maker and freeze according to manufacturer instructions. Scrape into container. Cover and freeze for 4 hours. This recipe freezes well. Cut each ingredient in half and process as usual. I have not yet tested the recipe with canned coconut cream (like Trader Joe's), but plan to. Canned coconut cream and coconut milk is not as sweet as cream of coconut, so the recipe would need extra sugar. Paula, let me know what you think of it when it’s done. I regularly make ice cream and HAD to check out this recipe. Lo and behold, I had all the ingredients in my pantry, in fact, most just needed to be used up. The partial jar of hazelnut spread had been hanging around for the longest time (maybe a year, at least a good 9 months) and the cream of coconut was from a wedding reception we threw 4 or 5 years ago. My maker is churning away even as I write. I agree about the the sweetness and I only had about half the required hazelnut spread. I used all my heavy cream in the mix and just added an extra cup of almond milk. Can’t wait to try it!!!!! We picked up the mocha version today for Jeff. This looks good! Dawn, I may have to try that. It might cut the sweetness a bit as well. Thanks for the suggestion. Or maybe you should try this first! But no, I haven’t seen all the coconut milk based ice creams. I do think if one were to use coconut milk with this, it would be a good idea to add a half cup or so of flaked coconut. The coconut flavor is not terribly strong (which is a good thing for some, but not others). Todd wanted more coconut flavor, but I liked it as is. I bet coconut milk would have worked fine, if not better. Have you seen how many people are making ice cream now with coconut milk? Well this might be a fun way to break it in again! That sounds really wonderful. We haven’t pulled out our ice cream maker in a LONG time!